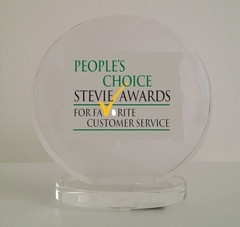 Consumers the world over now have an opportunity to tell the world’s best providers of customer service just how much they love them, by voting at https://peopleschoice.stevieawards.com in the People’s Choice Stevie Awards for Favorite Customer Service. This worldwide public vote is open through February 12, with the highest number of votes deciding the winners in 13 industry categories. All organizations honored in the Customer Service Department of the Year categories of this year’s Stevie Awards for Sales & Customer Service are candidates for the people’s choice awards. All customers, employees, fans, and followers of the nominated organizations are invited to vote. Nicknamed the Stevie® for the Greek word “crowned,” the awards will be presented to winners at the 10th annual Stevie Awards for Sales & Customer Service on Friday, March 4 at the Paris Las Vegas Hotel in Las Vegas, Nevada. Tickets for the event are now on sale. More than 450 executives from around the world are expected to attend.